Activation is a one time thing per computer. Normally an internet connection is required and after a quick exchange online you are all set. That said, sometimes a computer is intentionally not connected to the web. How does one activate in this situation? Well, it's a bit of a compromise. Continue reading for details. In addition to the computer you wish to install SteadyMouse on, you will temporarily need a laptop or some other device that does have internet access. You will also need a way to transfer a few files between them. A USB thumb drive or a portable hard-disk will usually do the trick if you have one. You should have a product key and download button recieved in your email after purchase. Make a text file, "my_activation_info.txt", on the USB drive. Then copy and paste your product key from the email and save it inside the text file. Disconnect the USB drive, and then connect it to the computer without internet. 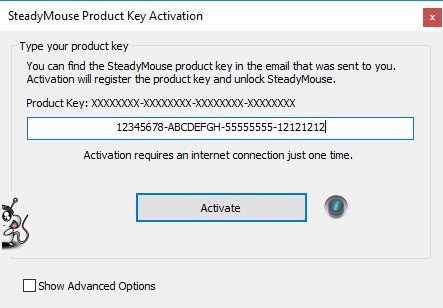 Run through the installation, and get to the point where SteadyMouse starts for the first time and asks you to activate. Click "Get Confirmation Code" and your default web browser will automatically launch. Select and then copy the URL from the browser's address bar. If nothing happens and the browser does not open, check that the computer has one installed. It needs Chrome, Firefox, IE, or similar even if it does not have internet. Paste the URL into the "my_activation_info.txt" file on your USB drive and save it. 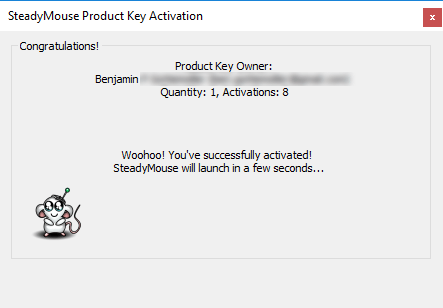 Leave the SteadyMouse Activation Window open as we will come back to it in a bit. Open a browser and paste the URL into the address bar. Press enter. 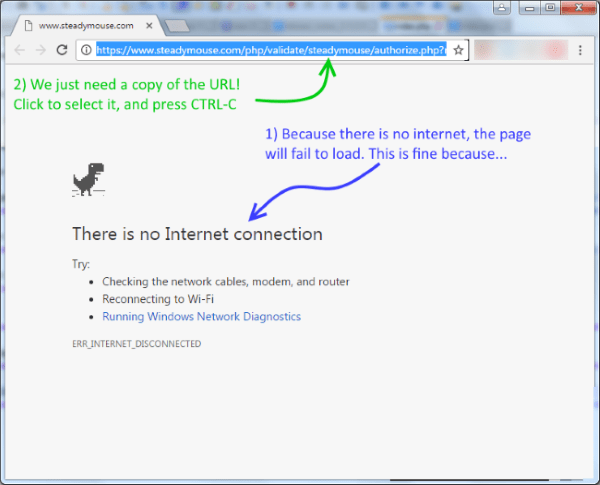 A page will then load containing a confirmation code for the computer without internet. This step uses up one activation. 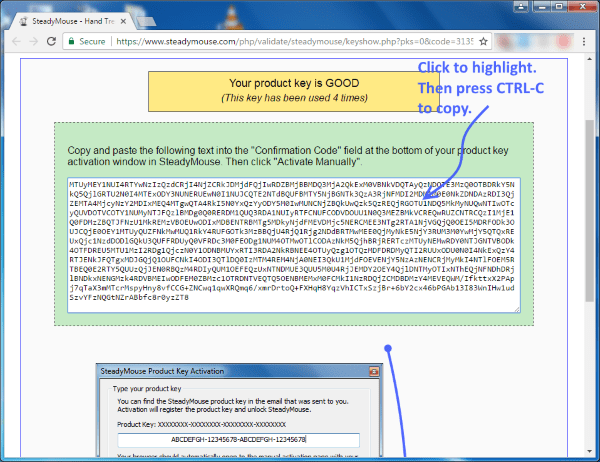 Copy the confirmation code from the webpage by clicking it and pressing CTRL-C. 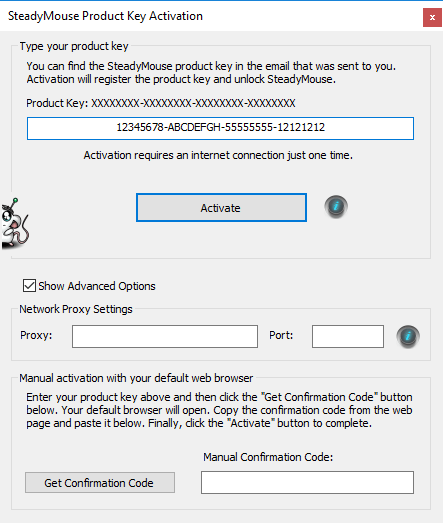 Paste the confirmation code into into the "my_activation_info.txt" text file on the USB drive. Save the file and then disconnect the USB drive. Move the USB drive back to the PC without internet one last time. Open "my_activation_info.txt" from the USB drive. Then copy and paste the confirmation code from the text file into the "Manual Confirmation Code" field within the Activation Window. You should never have to activate again as long as you do not uninstall the software. Future upgrades that fall under your license can simply be installed right over the top and the activation will be preserved.